There will be plenty of my family’s traditional food for Halloween over the next few weeks. This is a new, no-bake, and sure to be a firm favourite. A couple of months ago now The Foods of Athenry were kind enough to send me a sample of their multiple award winning Gluten Free Christmas Pudding to sample. As I’m a fan of all fruit cake, I’ve yet to eat one I don’t like, it wasn’t much of a hardship to sample the pudding. I know, I know it’s not even Halloween yet, but bear with me! I found it to be light, sweet and crumbly, however not quite as moist as I’m used to as we make a heavier steamed Christmas pudding. I guess that comes from the suet that we use in our traditional recipe, Foods of Athenry use cider and butter, which is gorgeous. When it comes to things like Christmas Cakes and Puddings, Brown Breads and other traditional Irish Family recipes I suppose I’m steeped so much in our traditions that it takes some getting used to when trying others! Anyway, once I got past the idea of eating pudding so early in the year, after sampling I was left with half a pudding which was sitting idly in the basin, taunting me. Normally I’d nip past every now and again with a spoon and a mug of tea but I was watching back issues of Nigella recently and noticed she had made “puddinis” last year. Puddinis are mini chocolate truffles made with Christmas Pudding. Well yes it is, but actually with the addition of some strategically placed icing, these “halloweeneys” are in season and the kids, nor the adults didn’t notice the decidedly Christmas flavouring. 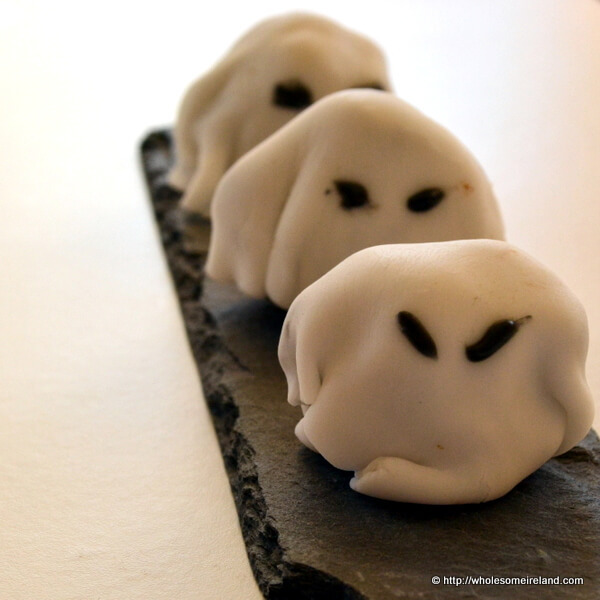 I’ve made these gluten free ghostly bites with Christmas Pudding from The Foods of Athenry, however I’ll make my next batch with some gluten free Barm Brack (traditional Irish Fruitcake). We do eat products containing gluten but we limit them where we can. 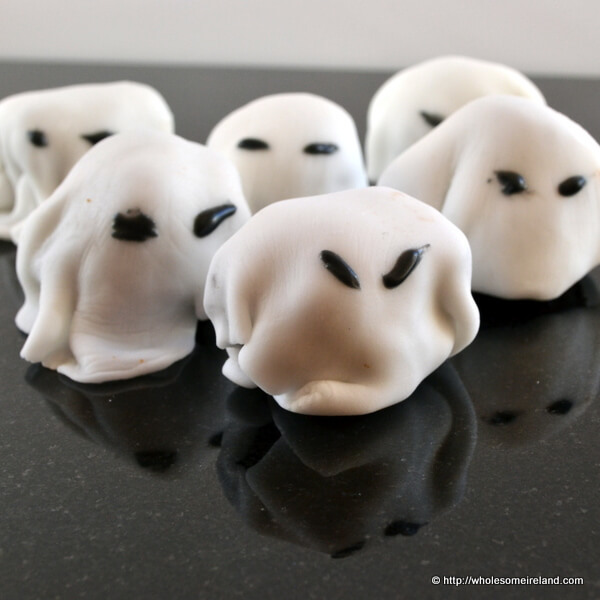 This recipe makes 10 ping-pong sized ghosts. For the purposes of the recipe please assume all the ingredients are gluten free, however that’s not to say that you can’t use conventional ingredients if you wish. Cakes under the fondant instead. Cheers! That’s a brilliant idea Lisa. They will work just as well! Love these, I have 2 little girls who will love them too. My crowd demolished the first lot, I’m going to be very busy the next week or so!